I know, I know– it was released two weeks ago and after all my hype, I still haven’t reviewed Jack Johnson’s new album, To the Sea. I typically wait a while after buying an album before reviewing it so that it has time to sink in, gel, grow on me, etc. So fret not, Googlers! I’ll post a review sometime next week. Some albums come in with a bang and hook me at first listen. Some come in with a whisper but grow to become favorites. To the Sea came in with a whimper, and the jury’s still out. I owe it to my man Jack to wait to review it until after an upcoming 14 hour road trip to the west coast. If it’s going to sink in, I’m guessing it will happen on the open road. LOVE the upbeat rhythm guitar intro! Jack’s writes some sweet song intros, and this one may just be one of his best. Very radio-friendly. Most of his singles are. Deeper cuts are sure to come on the album, which drops on June 1. I’m over-generalizing here, but Jack’s music can be roughly classified into three categories: Soundtrack/instrumental (his early stuff- think September Sessions or the Curious George soundtrack); Beach tunes (most everything prior to Sleep Through the Static); and the piano-driven ALO sound. “You and Your Heart” fits squarely in this third category. TANGENT: The third category merits some explaining- A very distinct change in Jack’s sound occurred when he added long-time pal and vocalist for ALO (Animal Liberation Orchestra), Zach Gill, to the band, and heavily incorporated Gill’s school-choral-room piano style into his subsequent work. The transition is best evidenced in Jack’s 2005 album, In Between Dreams. This album, in my opinion, was the perfect juxtaposition of all three of the categories I mentioned above (and it’s consequently my favorite album). NESTED TANGENT: While I consider myself something of an early days purist (most of my favorite Jack Johnson tunes come from his early soundtracks), the addition of Gill was a welcomed and natural evolution, which added an amazing dimension to the band’s sound. If you’ve never experienced ALO, I’d strongly recommend checking them out. I dig the dubbed self-harmony effect. I’m sure there’s a more official term for that, but I don’t have time to Google. This is something that has always worked for Jack, and it works great here. BOTTOM LINE: “You and Your Heart” is a rich, rolling track. If it’s representative of the rest of the album, To the Sea will be a gem. Listen to the whole track here. It’s available on iTunes now. The album will be released on June 1. See previous posts about Jack Johnson here. It’s been 2 years and 6 days since I tore the shrink wrap off a brand new* Jack Johnson release and slid it into my car stereo for a first-time listen. So as a Jack Johnson devotee from the J.O.A.T bootleg days, I’ve got one thing to say: It’s been a long 2 years and 6 days. Jack and his band, Adam Topol, Merlo Podlewski, and Zach Gill, have been putting countless hours in at the Mango Tree Studio to record their 6th studio album. The album, currently untitled, is being recorded on 100% solar energy in Hawaii and will be released worldwide the week of June 1st on Johnson’s own Brushfire Records label. Stay tuned, we’ll have more news for you on the album front in March and a new single out in April. Following the June 1st release of his new album, Johnson will embark on his first world tour since 2008, kicking off in Europe on June 16th. The tour will be a mix of headline shows London, Paris, Berlin, and Amsterdam and festivals including Glastonbury (UK), and Roskilde (Denmark). Stay posted, the US Tour dates will be announced in March. I just hope the new album will be more In Between Dreams and less Sleep Through the Static (his disappointing last release). STtS was a clear departure from the melody-driven, uke-laced tracks on IBD and the brilliant “Sing-A-Longs” from the Curious George movie. It’s a musician’s nature to mature and explore new areas, so I don’t expect a full return to the beach scene. But let’s at least get some sand on the toes this time around, eh Jack? * Yes, I know Jack’s live compilation, En Concert, was released back in October. I love live albums, but I have a hard time categorizing them as new albums. Click here for past blogging on Jack Johnson, and if you’re pining for a night under the stars immersed in the Jack Johnson vibe, be sure to revisit my 2-part review of the Salt Lake City stop on his STtS tour. Although the month of May tends to be one of the most hectic months of the year for me (end-of-year school programs for the kids, spring cleaning, garden planting, friends and relatives getting married, etc. ), it is also arguably my favorite month. This is probably due to the fact that no time of year was sweeter for me growing up than the last days of school before summer break. You remember those days, don’t you? Testing is wrapping up, projects are done and in, most of the serious stuff is over. It’s around this time of year that the world seems to let out a sigh of relief. Life in May– even for us hard working, child rearing, mortgage paying adults– seems a little like a Beach Boys tune. So for those of you who, like me, are stuck in some basement cubicle preparing TPS reports while nature is awakening outside, I’m going to post vids of some of my favorite summer tunes every week. First up is Mr. Jack Johnson with a song whose vibe screams ‘summer’ even though its lyrics are fairly depressing. That’s Jack’s magic- only he can take lyrics about politics and fish being poisoned and wrap them into a musical package that gives you the uncontrollable urge to go out and buy a surf board. Despite my less than glowing review of his latest album, regular readers of this website understand the significance of Jack Johnson’s music to me. So please don’t think I’m unduly knocking the guy when I call Brushfire Records’ newly released This Warm December: A Brushfire Holiday Vol. 1 simply lukewarm. I’m wary of contemporary Christmas albums because musically they tend to be flat and unoriginal- as if the artist realizes his album will spend most of the year gathering dust on a shelf somewhere. Why waste your imaginative tunes and best riffs on something that will be listened to for a maximum of 1.5 months per year? Most contemporary Christmas albums aren’t so much about Christmas spirit and traditions as they are about Christmas dollar signs. They’re mostly superficial nods to an already watered-down holiday. The relatively small palette of holiday standards has been rebooted so many times that contemporary artists taking their stab at it tend to overreach in order leave their stamp. The result is an uninspiring, often mangled rehash of songs that simply don’t need rehashing. Surprisingly, the reboots on Warm December aren’t half bad. Mason Jennings resists the temptation to overdo “Santa Claus is Coming to Town,” instead offering a pleasantly bare-bones version of the classic. Jack’s “Rudolph the Red-Nosed Reindeer” has been a family favorite ever since I got my hands on a copy of it 5 or 6 years ago (it’s definitely got that good old-school Brushfire Fairytales sound) It’s nice to see “Rudolph” appear on this album, though I would have appreciated some more new material. Zach Gill’s “Silent Night” is another example of the beauty of simplicity when it comes to Christmas standards. Just one beef– he’s replaced the phrase “Christ the Savior is born” in the song’s second verse with a repeat of “Sleep in heavenly peace” from the first. Not sure whether this was for stylistic reasons or politically correct ones. I’d like to think it’s the former. When rebooting the classics alone isn’t satisfactory, artists often feel like they need to add original tracks or covers– the love song that has nothing to do with the holidays but makes passing mention of Christmas in its hook in order to match the season; The generic lament about being alone for the holidays; a lame wish for world peace. And no contemporary holiday album would be complete without the classic “only wanting you for Christmas” song? You know exactly what I’m talking about, don’t you? It’s because they’re on every single album. And Warm December is no exception. Here is where this album fits the mold of its sub-par contemporaries. I’ll be honest; the lyrics to Jack’s “Someday At Christmas” almost made me dry heave (Someday at Christmas men won’t be boys/Playing with bombs like boys play with toys…) You know I love you, Jack, but I’m sick of the politics. I’m sure it’s a hit with the college crowd, but it just ain’t doing it for me. All the same, Jack’s use of the subtle self-provided harmony on the track is very well done. Matt Costa’s “All I Want For Christmas” might be ok if it didn’t sound like he’s singing “All I wants a Christmas is you” over and over again. Money Mark’s track has kind of a catchy synthesized melody, but the trite lyrics are cringeworthy. Similarly, while G. Love’s “Christmas Baby” and ALO’s “Christmas Time” are fine musically, the tracks on the whole are nothing to write home about. Covers by Neil Halstead and Rogue Wave are airy, smooth, and true to form– but ultimately forgettable. The obvious standout on Warm December is newcomer Zee Avi’s “No Christmas For Me.” Avi’s dusky vocals are fresh, cheery and genuine. She’s the only artist on the disc that sounds like she gave this song her all. If you buy this CD, buy it for her track (or you can download the track alone for free as a promo from Jack Johnson’s iLike page. You can listen to the entire album while you’re at it). I’ve been impressed by Avi’s talent and humble personality since I discovered her on YouTube several months ago, and I wrote about her in September. If the amount of hits I get on that post every day is any kind of indicator, the young artist formerly known as Koko Kaina has the potential to make it big. I still haven’t heard when Brushfire plans on releasing her freshman album, so “No Christmas For Me” and her YouTube vids will have to tide us over until then. Bottom Line: Warm December is overall a lukewarm album. 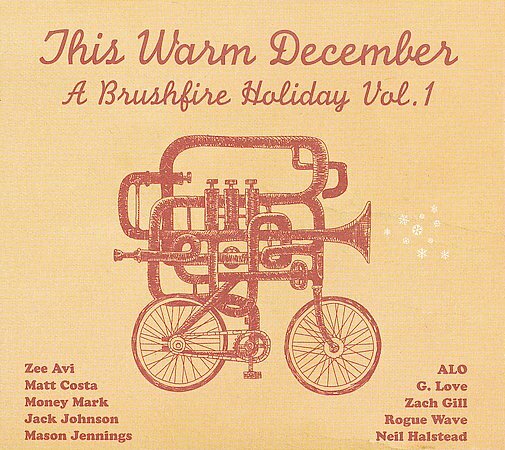 If you follow the Brushfire artists closely, are a completist, or prefer shallow holiday-ish tunes to more authentic Christmas music, you’ll probably like it. A good chunk of the sales profits will go to musical education for kids, making it a worthy purchase. Otherwise, download Zee Avi’s track and hope for a warmer December if a second volume is released.